I'm making cupcakes for my sons party. There is a child with a red dye allergy. I wanted to make tie dye and usually use regular food coloring. Are there any safe dyes I can use? Beautiful teething necklaces for mom!! Liam and Julia arrived 11-17-11. India Tree makes some natural dyes that are good, but nothing will get you anywhere close to the look you are going for except the artificial stuff. I would suggest doing a tie dye "topper" of some sort, perhaps out of paper, glued to a wooden stick? You can use regular frosting and just stick the topper on each one, or at the very least do that for the kid with the allergy. We don't eat/use dyes. I have found that cupcake toppers are the way to go, and it saves the 3-days-later food dye stains on their faces too! I did little apples with a paper punch for DS' orchard party, and just glued them to tiny wooden popsicle sticks that I got at the craft store. So cute! Last edited by Green Decals; 01-18-2013 at 11:47 AM. My son and daughter have a "red dye" sensitivity. I keep him away from all artificial dye because other colors, most of them, have red in them. My daughter is actually more affected by colors other than red, but the family all still says "red dye." I'm trying to get them out of that habit and just say artificial dyes. (I actually keep all my kids away from it so they don't feel singled out. His is worse than hers.) I is very sweet of you to think of them. We have never had anything think of us and we have to decline or figure something out. When it comes to cupcakes or cake, I usually remove the icing if it's colored. Natural colors are expensive and not the same. You don't get the bright color and they can be unpredictable in how they will look. You can buy them online though. A good option is what pp said about making a removable decoration. Very sweet of you! Good luck! Last edited by HeatherlovesCDs; 01-18-2013 at 12:23 PM. What if you made the cupcakes as planned, but mad some of them without the dyes? And just add the decorations to ALL the cupcakes? Thanks everyone. There is a child with a tree nut allergy and the red dye allergy. I may just do a vanilla/chocolate swirl cupcake. With chocolate safe sprinkles. I'm trying to be thoughtful. My son does not have food allergies. I'm sure it's very hard. These are the ones I did for my twins first bday. So cute and popular. Oh, the dye is in the cake itself? I wasn't understanding that. Yeah, if we were there, our family would pass on eating them. Maybe you could make those and make another batch of some without color for the one with the dye sensitivity. The boxed stuff only takes a few minutes to throw together and is super cheap. It is a pain. They dyes aren't as bad as other things, but it is still annoying. At Christmas, our church had a children's Christmas play. There was lunch before the play. My son put something on his plate with red dye in it. (Jello mold, I think) My husband noticed it and said something to me. I thought he took it off. He thought I did. It wasn't till my son couldn't keep himself under control while in the kids choir in the play that we realized something was up and it was the jello, which he had eaten. Oops!! The dyes make my son really hyper and he can't control himself. I almost had to take him down in the middle of the play. Of all the times for us to miss it. Last edited by HeatherlovesCDs; 01-18-2013 at 09:14 PM. As far as I know DS doesnt have a food allergy, but to be honest, I find dyed foods to be really creepy. I know there's dye in all sorts of things, but dyes in cakes creep me out. Funny i'm ok with dyed icing, to a point, but when the actual cake is dyed I think it's bizarre. 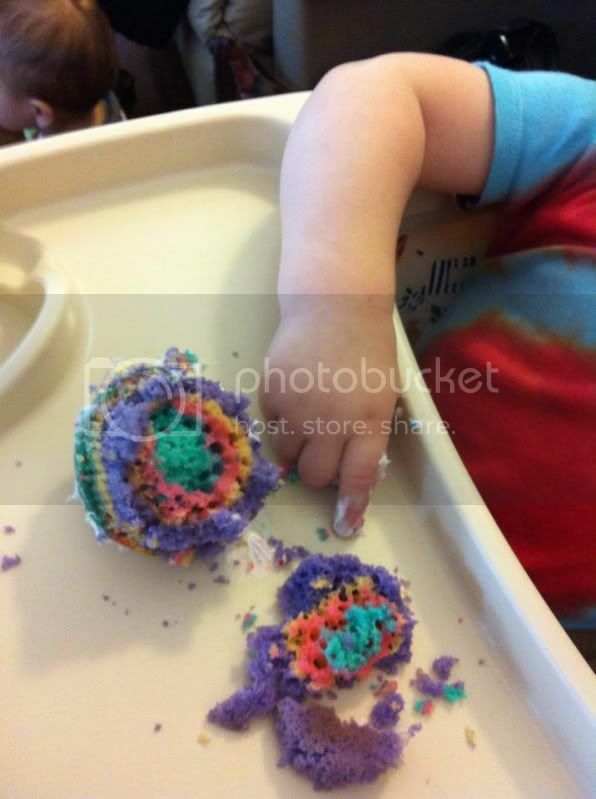 If it were me I'd do white cake in tye dye cupcake liners with white frosting and a topper decoration. Or I'd use strawberry and blueberry frosting (naturally colored with the berries) and swirl them. I love the idea of using strawberries to dye the icing. Why didn't I think of that?? ?